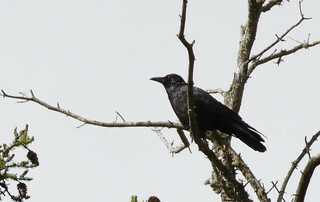 This is the orientalis subspecies of Carrion Crow, sometimes known as Oriental Crow. Its larger than the nominate with a larger bill. The eastern and western races of Carrion Crow are separated by a large area occupied by the Hooded Crow, Corvus cornix. There is some evidence to suggest that the 2 races of Carrion Crow should be recognised as separate species. Elevation 3,076m, Baxi Forest, Sichuan China.